Formerly the headquarters of Rancho Salinas, this community was once a favored crossing point for Pre-Columbian tribes. 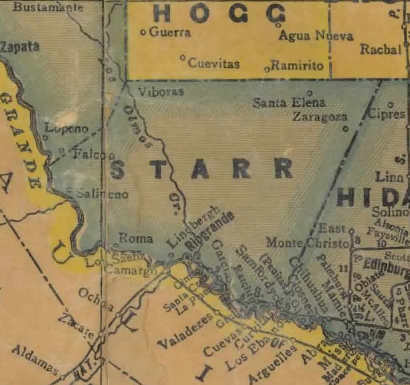 It was part of Nuevo Santander province under Spanish rule and with Mexican Independence, it became part of Tamaulipas State. After the Mexican War, it became a part of the United States. In the 1750s, five area ranches raised thousands of horses and as many as 40,000 head of sheep. In the past, residents were mostly ranch workers and migrant laborers. The 1990 population was reported as 155 which increased to 304 by the 2000 census. Texas Escapes, in its purpose to preserve historic, endangered and vanishing Texas, asks that anyone wishing to share their local history, stories, and vintage/historic/recent photos of their town, please contact us.